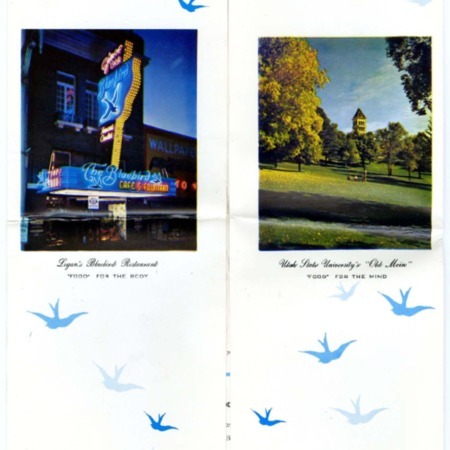 Menu for the Bluebird Cafe in Logan, Utah from 1966 to 1967. Includes list of soda fountain specialties, special sundies, sandwiches, "America's Favorite 4" : Bluebird cheeseburger, ham and eggs, fried spring chicken, and jumbo fried shrimp, steaks, fish cocktail, and salads. Brochure also includes promotional material for Logan. Images of Bluebird sign lit up with the caption of "Food" for the Body; Old Main with caption "Food" for the mind, and the Logan L.D.S. temple with the caption "Food" for the spirit. Reproduction for publication, exhibition, web display or commercial use is only permissible with the consent of the USU Special Collections and Archives, phone (435) 797-2663. 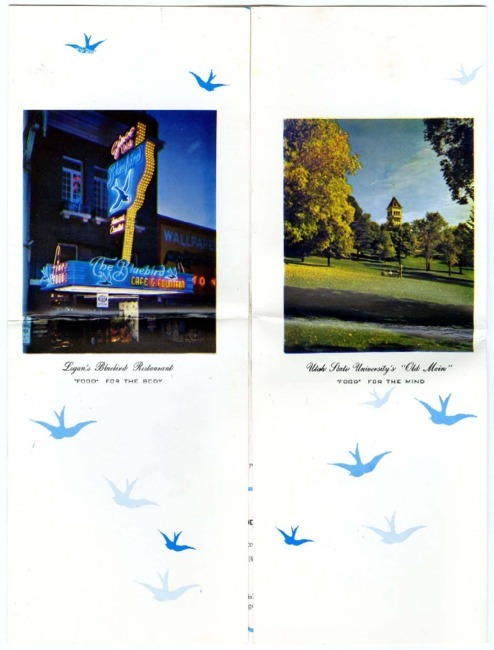 “The Bluebird menu, 1966 and 1967,” Highway 89, accessed April 22, 2019, http://highway89.org/items/show/10259.